The Watsons Go to Birmingham – 1963 (1995) is a historical-fiction novel by Christopher Paul Curtis. First published in 1995, it was reprinted in 1997. It tells the story of a loving African-American family living in the town of Flint, Michigan, in 1963. When the oldest son (Byron) begins to get into a bit of trouble, the parents decide he should spend the summer and possibly the next school year with Grandma Sands in Birmingham, Alabama. The entire family travels there together by car, and during their visit, tragic events take place. The book was adapted for a TV movie of the same name, produced in 2013 and aired on the Hallmark Channel. The book takes place from approximately January to October 1963, a turbulent time during the Civil Rights Movement. The Watson family is fictional, but the characters are based on members of the author's family, including himself, and many of the events in the first half of the book are based on events from the author's childhood and additional personal events. Events later in the story center around the historic 1963 16th Street Baptist Church bombing in Birmingham, soon after the civil rights protests had gained negotiation with white city leaders for integration. KKK members bombed the church on September 15, 1963, killing four girls and injuring many more. In the novel, the incident is depicted as occurring a bit earlier than the historical date, allowing the Watson family to still be on summer vacation in Birmingham when it took place. The bombing was a catalyst for increased activity in the Civil Rights Movement and work on voter registration in Mississippi, during Freedom Summer of 1964. The novel is a first-person account narrated by Kenny Watson, who lives in Flint, Michigan with his parents, Daniel and Wilona Watson, his older brother Byron, and younger sister Joetta. The opening chapters establish Kenny as a very bright and shy 4th grader who has difficulty making true friends until Rufus Fry arrives in town from Arkansas. Rufus is also bullied by the students at Clark Elementary for his "country" clothes and accent, making Kenny reluctant to befriend him at first, but they are soon inseparable. Kenny is alternatively bullied and protected by his 13 year old brother Byron, whom he calls "an official teenage juvenile delinquent". Byron has been retained twice because he often skips school and is still in 6th grade. He invents a series of "fantastic adventures" which constantly get him into trouble and include playing with matches in the house and setting things on fire, abusing his parent's credit at the corner grocery store to buy himself treats, and getting a "conk" hairstyle against his parents' orders. Daniel and Wilona eventually become so frustrated with their inability to "straighten out" Byron that they decide to send him to Birmingham, Alabama to live with Grandma Sands (Wilona's mother) for at least the summer and possibly an entire year. As soon as the school year concludes, the Watsons ready their car ("the Brown Bomber") and embark on a road trip from Flint to Birmingham to deliver Byron to his grandma Sands. Kenny had been looking forward to the "battle royal" between his grandma and Byron, but is disappointed when just a few sharp words from the "old, old lady" have Byron speaking respectfully and generally behaving himself, causing Kenny to seek out his own "adventures". Grandma Sands had warned the children to avoid a particular local swimming hole because of a dangerous "whirlpool", which Kenny misheard as "Wool Pooh" due to her thick Alabama accent. Kenny wants to swim there anyway, and is frustrated when Byron and Joetta refuse to go along. Ignoring the warnings of both Grandma Sands and Byron, Kenny jumps into the seemingly tranquil pool and edges deeper and deeper water until he loses his footing and almost drowns. Remembering his grandmother's words, he imagines that a strange monster he thinks is the mysterious "Wool Pooh" swam up from below to grab his ankle and pull him under. Byron returns and jumps in to save Kenny just in time. He later insists that there was nothing else in the water, but Kenny is convinced that the Wool Pooh actually exists. Shortly afterwards, a bomb goes off at a nearby church where Joetta is attending Sunday school. (This was the 16th Street Baptist Church bombing, a real historical event.) Kenny wanders into the still-smoking church in the immediate aftermath looking for his sister, but instead sees the Wool Pooh in the smoke clinging to a torn girl's shoe that looks like Joetta's. In shock, he walks back to Grandma Sands' house without anyone noticing that he had been at the church, and he's again shocked and confused to find Joetta already there. She claims that it was Kenny who had called her away from the church and led her home, and she does not even know that a bombing had taken place right after she'd left Sunday school. As soon as they realize that Joetta is safe, the Watsons decide to immediately return home to Flint, trying to avoid explaining the full implications of what has happened to the children. Kenny is unable to process the events in Birmingham and avoids his family and friends over the ensuing weeks, instead spending many hours hiding behind the sofa. Byron eventually coaxes him out and gets Kenny to talk about what happened, which finally brings a flood of tears from Kenny. Encouraging his little brother to "keep on stepping", Byron explains that although the world is not perfect, he has to keep moving on. Kenneth Bernard "Kenny" Watson - The main character and narrator of the story, the younger of the two sons of the Watsons. Kenny is ten years old. He is an excellent/intelligent student with many capabilities, which makes him the target of bullying at Clark Elementary School. Wilona Sands Watson - Usually referred to as "Momma", she is the wife of Daniel and the mother of the three children. A native of Birmingham, she slips into a thick Southern accent when mad or excited, and complains about Flint's harsh winters. She is strict and overprotective but loves her kids. Daniel Watson - The husband of Wilona and father of the three children. He's known for having a good sense of humor and is referred to as "Dad". Byron "Daddy Cool" Watson - Older brother of Kenny and Joey. He is considered the "God" of Clark Elementary School. He bullies smaller kids along with his best friend Buphead. He is known for being a terrible student and is also known for breaking the rules and being a rebel. Byron is thirteen. Joetta "Joey" Watson - Younger sister of Byron and Kenny. She follows the rules and is very religious. Joey has a special relationship with Byron. She is five. Buphead - Byron's best friend, who is also an "official delinquent," helps Byron bully many kids, including Kenny, although Byron and Buphead stand up for Kenny and Rufus when they're being bullied by Larry. Rufus Fry - Kenny's new best friend and Cody's big brother. His family moves to Flint from the South. He and his little brother Cody befriend Kenny. Cody Fry - Rufus's little brother. Rufus and Cody come from a poor Southern African-American family. Lawrence "Larry" Dunn - the school bully in Kenny and Rufus's class, until Byron teaches him a lesson for stealing Kenny's winter gloves. Mr. Robert - a dear friend of Grandma Sands. Mr. Robert started helping Grandma Sands out around the house after her husband died. It's hinted that Grandma Sands has a crush on Mr. Robert. Mrs. Davidson - is the religious next-door neighbor of the Watsons. Joey goes to church with Mrs. Davidson three times a week. Sometimes Wilona makes Kenny go to Sunday School with Joey. 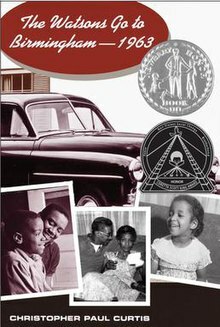 The Watsons Go to Birmingham – 1963 was Christopher Paul Curtis's first novel, earning him a Newbery Honor, a Coretta Scott King (wife of Dr. Martin Luther King, Jr.) Honor, and the Golden Kite Award. Curtis also wrote the Newbery Award-winning novel Bud, Not Buddy; Elijah of Buxton, and The Mighty Miss Malone. In 2013, a television film based on the book premiered on the Hallmark Channel, starring Anika Noni Rose, Wood Harris, Latanya Richardson, Skai Jackson and David Alan Grier. The movie adapted the story by condensing and trimming events and characters from Flint in the first half of the novel and adding new scenes showing Kenny and Byron helping local youths organize Civil Rights events in Birmingham. This page was last edited on 14 March 2019, at 19:47 (UTC).